Orbital mechanics, also called flight mechanics, is the study of the motions of artificial satellites and space vehicles moving under the influence of forces such as gravity, atmospheric drag, thrust, etc. Orbital mechanics is a modern offshoot of celestial mechanics which is the study of the motions of natural celestial bodies such as the moon and planets. The root of orbital mechanics can be traced back to the 17th century when mathematician Isaac Newton (1642-1727) put forward his laws of motion and formulated his law of universal gravitation. 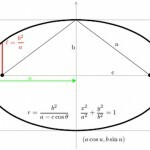 The engineering applications of orbital mechanics include ascent trajectories, reentry and landing, rendezvous computations, and lunar and interplanetary trajectories.